It was nice to be mainly in cash during Tuesday’s decline. I own a little QID, which rises 2X as much as the QQQQ falls. I will wait for the short term trend to turn up again before I acquire any long positions. The key to success in the market is to lose little during market down-trends. 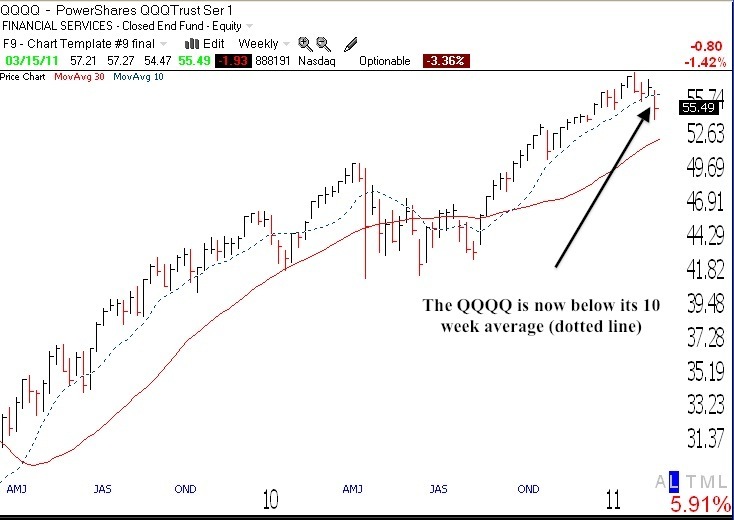 As long as the QQQQ remains below its 10 week average, I will not buy growth stocks. (Click on weekly chart to enlarge.) The longer term trend remains up, in a Stage 2 advance. When you have a minute, what were the GMI and GMI2? Thanks for a brief update. Check out the table in Monday’s post. “Nice to be out in this week’s downtrend”. Psychological fear? However, in and out of market costs fees, and you lose some of the momentum when you re-enter. I feel the short term correction is overdone compared to the long term positive fundamental reality. So, I am weathering the short term volatility until the bull rally restarts. I am staying the course with a stop ABOVE my entry point in SXCI!!! I think one advantage us individual investors have is agility. And with only a few positions at any time, the trading costs aren’t too prohibitive. Dr. Wish – do you pyramid your buys when you enter a position? A lot of folks seem to recommend that approach, but I always feel comfortable making my biggest purchase once the first one is shown to be correct (i.e. I would buy $1k, then $4k, then $3k, then $2k to build a $10k position if a stock continues to do well). What is your general approach to building a position? You are correct that with discount brokers, transaction costs are irrelevant. I never let them keep me in a losing position. Losses dwarf commissions. I use both types of buying techniques, large initial buy and accumulating a position in stages. It depends on my confidence in that trade and the market’s trend. I look for no buys during a down-trend. Good patterns typically fail.